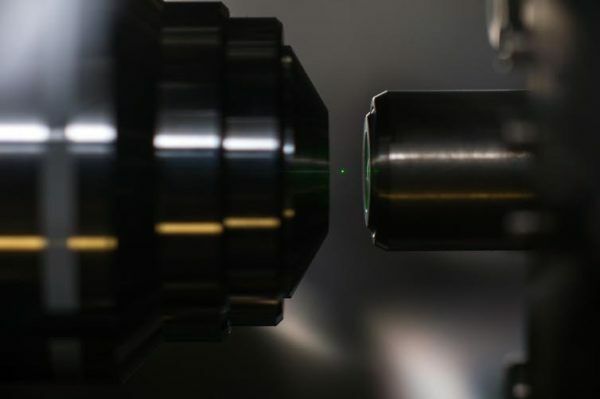 One might think that the optical tweezer – a focused laser beam that can trap small particles – is old hat by now. After all, the tweezer was invented by Arthur Ashkin in 1970. And he received the Nobel Prize for it this year – presumably after its main implications had been realized during the last half-century. Amazingly, this is far from true. The optical tweezer is revealing new capabilities while helping scientists understand quantum mechanics, the theory that explains nature in terms of subatomic particles. This theory has led to some weird and counterintuitive conclusions. One of them is that quantum mechanics allows for a single object to exist in two different states of reality at the same time. For example, quantum physics allows a body to be at two different locations in space simultaneously – or both dead and alive, as in the famous thought experiment of Schrödinger’s cat. The two states of Schrodinger’s cat: dead (on the left) and alive (on the right). Quantum physics says the cat can exist in both states simultaneously. The technical name for this phenomenon is superposition. Superpositions have been observed for tiny objects like single atoms. But clearly, we never see a superposition in our everyday lives. For example, we do not see a cup of coffee in two locations at the same time. To explain this observation, theoretical physicists have suggested that for large objects – even for nanoparticles containing about a billion atoms –superpositions collapse quickly to one or the other of the two possibilities, due to a breakdown of standard quantum mechanics. For larger objects the rate of collapse is faster. For Schrodinger’s cat, this collapse – to “alive” or “dead” – would be practically instantaneous, explaining why we never see the superposition of a cat being in two states at once. Until recently, these “collapse theories,” which would require modifications of textbook quantum mechanics, could not be tested, as it is difficult to prepare a large object in a superposition. This is because larger objects interact more with their surroundings than atoms or subatomic particles – which leads to leaks in heat that destroys quantum states. As physicists, we are interested in collapse theories because we would like to understand quantum physics better, and specifically because there are theoretical indications that the collapse could be due to gravitational effects. A connection between quantum physics and gravity would be exciting to find, since all of physics rests on these two theories, and their unified description – the so-called Theory of Everything – is one of the grand goals of modern science. Optical tweezers exploit the fact that light can exert pressure on matter. Although the radiation pressure from even an intense laser beam is quite small, Ashkin was the first person to show that it was large enough to support a nanoparticle, countering gravity, effectively levitating it. In 2010 a group of researchers realized that such a nanoparticle held by an optic tweezer was well-isolated from its environment, since it was not in contact with any material support. Following these ideas, several groups suggested ways to create and observe superpositions of a nanoparticle at two distinct spatial locations. An intriguing scheme proposed by the groups of Tongcang Li and Lu Ming Duan in 2013 involved a nanodiamond crystal in a tweezer. The nanoparticle does not sit still within the tweezer. Rather, it oscillates like a pendulum between two locations, with the restoring force coming from the radiation pressure due to the laser. Further, this diamond nanocrystal contains a contaminating nitrogen atom, which can be thought of as a tiny magnet, with a north (N) pole and a south (S) pole. The Li-Duan strategy consisted of three steps. First, they proposed cooling the motion of the nanoparticle to its quantum ground state. This is the lowest energy state this type of particle can have. We might expect that in this state the particle stops moving around and does not oscillate at all. However, if that happened, we would know where the particle was (at the center of the tweezer), as well how fast it was moving (not at all). But simultaneous perfect knowledge of both position and speed is not allowed by the famous Heisenberg uncertainty principle of quantum physics. Thus, even in its lowest energy state, the particle moves around a little bit, just enough to satisfy the laws of quantum mechanics. Second, the Li and Duan scheme required the magnetic nitrogen atom to be prepared in a superposition of its north pole pointing up as well as down. Finally, a magnetic field was needed to link the nitrogen atom to the motion of the levitated diamond crystal. This would transfer the magnetic superposition of the atom to the location superposition of the nanocrystal. This transfer is enabled by the fact that the atom and the nanoparticle are entangled by the magnetic field. It occurs in the same way that the superposition of the decayed and not-decayed radioactive sample is converted to the superposition of Schrodinger’s cat in dead and alive states. Collapse of the superposition into a single location. What gave this theoretical work teeth were two exciting experimental developments. Already in 2012 the groups of Lukas Novotny and Romain Quidant showed that it was possible to cool an optically levitated nanoparticle to a hundredth of a degree above absolute zero by modulating the intensity of the optical tweezer. The effect was the same as that of slowing a child on a swing by pushing at the right times. In 2016 the same researchers were able to cool to a ten-thousandth of a degree above absolute zero. Around this time our groups published a paper establishing that the temperature required for reaching the quantum ground state of a tweezed nanoparticle was around a millionth of a degree above absolute zero. This requirement is challenging, but within reach of ongoing experiments. The second exciting development was the experimental levitation of a nitrogen-defect-carrying nanodiamond in 2014 in Nick Vamivakas’s group. Using a magnetic field, they were also able to achieve the physical coupling of the nitrogen atom and the crystal motion required by the third step of the Li-Duan scheme. The race is now on to reach the ground state so that – according to the Li-Duan plan – an object at two locations can be observed collapsing into a single entity. If the superpositions are destroyed at the rate predicted by the collapse theories, quantum mechanics as we know it will have to be revised.